Hey, hey, hey! 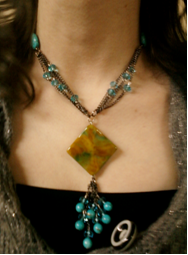 We have again another jewelry making idea that you can add to your box of crafts!!! Since we have started learning how to make wire jewelry, might as well get the hang of it and practice, practice, practice for us to be familiar with some basic terms and techniques. In line with our Wire Jewelry Beginner Lessons Series, we will be using jewelry findings head pins and jump rings. In addition, we’ll have you introduced to materials like chain and barrel clasp. 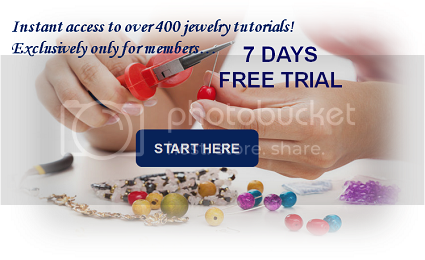 If head pins and jump rings are still unfamiliar to those who have just visited us, Handmade Jewelry Club website you can learn the basics about head pins here and the jump rings on this page. There’s a variety of chains available in the market. You can find them in different colors and different styles. There are some chains that are with big circle or small circle linked together and you can buy them by meters while some stores offer them in pre-cut lengths. That’s one good thing about chains. Since you can buy them by meters you can cut them to your preferred length. To cut a chain, just pick one circle or link and then use a wire cutter to cut the link. Barrel claps on the other hand is a type of lock with a screw thread. It has loops at both ends to attach your necklace or bracelet. Mostly, barrel claps are available in gold and silver. However, you can also find barrel clasps without loops at the end but have wholes instead. These type of barrel clasps is ideal only using threads were you can insert the thread, tie a knot inside the barrel to attach it. Now, let’s begin making our Unique Necklace and start with the pendant. Start assembling the beads and crystals. With the head pins slide in 1 bead and 1 crystal and make a loop with the excess wire. Create 7 sets of beads and crystals. Cut different lengths of chain, according to your preferred length like shown in the picture and group the chain in one jump ring. With your nose pliers, wrap your wire neatly and tightly onto the jump ring. Slide in the square shaped semi-precious stone, and on the other create a loop. Loop the wire twice to make the pendant sturdy enough. Then cut excess wire. Now you have your pendant! For now, let’s stop here and continue creating the chain necklace on my next post. See you then. Ciao! Update: you can check part 2 here!